The Birds Of A Feather Team Challenge begins Monday, March 18th at 7AM GMT and ends on Saturday, March 23rd at 6:59AM GMT. What’s a team challenge? Well, Swagbucks Monthly Team challenges allow you to play on a team with other Swaggernauts (Swagbucks Members) where you contribute points to your team by earning SB! Join the Winter Getaway Team Challenge now! Introducing Swag IQ – our latest app that allows you to earn BIG SB by playing our live trivia game. Each day that you earn SB from playing, you’ll contribute 50 points to your team. Play & earn every day and you’ll contribute 200 points per challenge! Download the app and be ready for our game at 1AM GMT Monday through Thursday and Fridays at 8PM GMT. Redeem a Swag Code through the SwagButton or through the Swagbucks Mobile App and contribute 5 points to your team. Swagbucks release 1 Swag Code every day. Make sure to subscribe to the GPT Genies’ Swagcode thread on Facebook so you never miss a code. All members who participate and contribute at least 600 points to their team’s total will receive a SB bonus in the form of a SB Swag Up Rebate! Members of the 1st place team will receive a 100 SB Swag Up Rebate, members of the 2nd place team will receive a 50 SB Swag Up Rebate and the 3rd place team will receive a 25 SB Swag Up Rebate. The Swag Up Rebate will be made available on March 25th and will expire on April 9th at 6:59AM GMT. So what are you waiting for? Join the Winter Getaway Team Challenge now! Come and let us know which team you’re on in the GPT Genies Facebook group! Don’t know what a Team Challenge is? 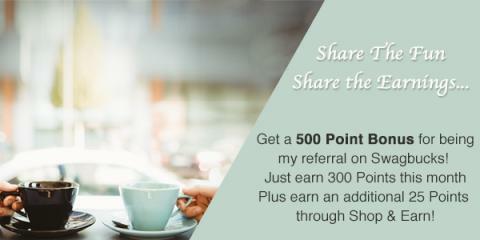 Confused about how you can earn points? Click here to find out everything you need to know about Team Challenges. Read all about Swag Ups here. Find out about other bonuses you can earn here.